While you might enjoy a 7UP now and again, you probably know you’re drinking a soda and not some sort of healthful elixir with magic antioxidants derived from a bunch of berries. But one advocacy group is suing Dr Pepper Snapple, the makers of varieties of 7UP, saying it’s misleading consumers about the health benefits of the beverage. 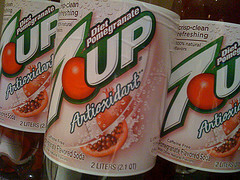 Like Coca-Cola before it with the ill-fated Diet Coke Plus “with Vitamins & Minerals,” the Center for Science in the Public Interest wants 7Up to change its tune. The group is suing 7UP with claims that its advertising suggests that the drinks have antioxidants from blackberries, cherries, cranberries, pomegranates and raspberries instead of just some added Vitamin E, reports Reuters. Snapple’s spokesman insists however that 7UP Cherry has a label that’s up to snuff with the FDA and doesn’t claim to contain any juice. The next iteration of the product won’t have antioxidants at all, so there. But there then there’s 7UP Mixed Berry Antioxidant and Diet 7UP Mixed Berry Antioxidant. The lawsuit seeks class-action status in a U.S. District Court in Los Angels on behalf of anyone who’s bought the products in question.